Under the benign gaze of King Juan Carlos, I am listening to three Galicians speaking animatedly about their language and what it means to them. There is a certain irony in the fact that we are gathered beneath a portrait of the king, at the Spanish Institute on the outer reaches of London’s Portobello Road. For all his benevolent condescension and charming smile, Juan Carlos represents the Spanish state, which, in the eyes of many fighting for Galician rights, is the enemy. Although Galician has around 2.5 million speakers in its home country, and is therefore in a far more secure position than most endangered languages, it is a minority tongue in Spain. Its speakers, based in the Autonomous Community of Galicia in the northwest, face similar difficulties to those trying to maintain minority languages the world over: lack of official recognition and an inferiority complex instilled by decades of being told that the language is second-rate. In other words, a vibrant, expanding Galician language is perceived as a threat and is therefore not to be tolerated. Galician politicians are banned from speaking Galician in the Spanish parliament in Madrid, and when two Galician MEPs made a point of speaking in their own language at the European Parliament in Brussels in 2007, they caused shock waves. ‘The Spanish politicians hated it!’ Carlos smiles. He believes that supranational bodies such as the European Union (EU) give minority language speakers the opportunity to circumvent obstructive politicians at home: ‘The EU gives us a chance to dilute the power of the Spanish state,’ he notes. The second major hurdle is Galicians themselves, many of whom no longer see the value in speaking their own language. Xaime is a teacher of both Spanish and Galician, and he sighs as he tells me how exhausting it is trying to persuade his pupils that Galician is worth learning. Although 90 per cent of Galicians speak the language to some extent, only around 50 per cent do so as a matter of routine. ‘Children think it is more important to speak English than Galician – a big mistake,’ he says. Xaime, Xesus and Carlos: ‘Your language makes you who you are’. Of course, languages are ‘living’ entities and as such are born, flourish, mutate, wither and die in a natural cycle. This has happened ever since our ancestors started communicating in a proto-language some 150,000 years ago and is why none of us is currently speaking Phoenician or Etruscan. Languages adapt, assimilate and change very quickly. Listen to a group of teenagers chatting among themselves and this becomes evident: the neologisms and deconstruction of ‘accepted’ grammar may make parents and teachers shudder, but such developments are a sign of the robust health of a language, not its decay. Dialects spoken by youth and subcultures drip-feed into the dominant or standard language, both enriching it – in ways seldom acknowledged by the establishment – and encouraging social inclusion by crossing the class and race divide. Some people argue that, since languages ebb and flow as part of a natural order, it is pointless trying to save them. But the current threat to most of the world’s 7,000 languages is far from being a natural phenomenon. Rather, the threat comes from geopolitical prerogatives, inequality, poverty and rampant globalization. Linguists believe that language loss is now taking place at an unprecedented rate, as is the spread of half a dozen globally dominant languages, which, if we don’t act now, may be all we are left with in 100 years’ time. 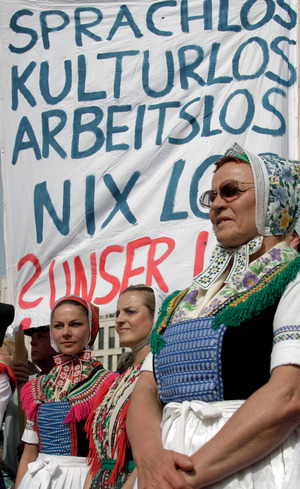 ‘No language, no culture, no job, no nothing: our fate’: members of the Sorb community in eastern Germany take their message to Berlin. Colonization and the rise of the nation-state in the 18th and 19th centuries laid the groundwork for the situation in which we now find ourselves. As lands were conquered, indigenous people were wiped out or scattered. Their languages were banned or suppressed, either overtly, using horrific physical and psychological methods, or covertly, with rulers extolling the virtues of their own modern, relevant languages, which, they said, would offer the locals a chance to better themselves and, of course, lead them to salvation. Nation-states were created, often with arbitrary borders based on geographical or political expediency, leaving language communities suddenly cut off from each other. In the 20th and 21st centuries, millions have migrated to towns and cities in search of work. They have had to learn the language of the metropolis or cope by creating new pidgins (see box) their mother tongues – which tend to flourish best in remote rural communities where they are less open to challenge – abandoned. Even otherwise positive developments, such as improved primary-level education across the Global South, have been detrimental to minority languages, few of which are taught in schools, and many of which have no written form. Governments often fail to protect or promote their country’s minority languages, fearing that significant minority groups speaking a different tongue within their borders could result in political disturbance, as such communities demand greater recognition, autonomy or even independence. France – one of Europe’s most intransigent nations with regard to minority language rights – seems to have forgotten not only that ‘standard’ French was itself a minority language until the 1789 French Revolution, but also that the French Resistance helped the Allies during the Second World War by sending messages in Occitan (spoken in the Pays D’Oc) in order to confound the Germans. However, some gains have been made in the past 50 years. With language rights increasingly being seen as an inalienable human right, the United Nations, EU and some individual countries, including the US, Canada, New Zealand/Aotearoa and Britain, formulated new charters, laws and declarations to defend them. Linguists, too, woke up to the urgency of documenting endangered languages. There was a flurry of interest, books were published, ‘last speakers’ filmed (their demise is still regularly reported in the mainstream media, though as a regrettable fact rather than as a call to arms). But this is not enough, and a handful of linguists, including Suzanne Romaine of Oxford University have become vocal advocates of not merely preserving, but also revitalizing, endangered languages. The witticism that ‘a language is a dialect with an army and a navy’ is not far from the truth. One of the reasons that linguists are so hesitant to put a firm figure on how many languages exist is that they can’t agree on what qualifies as a language. Some go so far as to say that there are no languages at all – just tens of thousands of dialects, with a few having floated to the top, by chance or design, to be skimmed off and promoted as the standard. In the end, linguists say, every tongue in existence today has its roots in the same, single language our ancestors started speaking 150,000 years ago. Yet if all languages are equal in theory, in practice some are more equal than others. Dialects, creoles and patois are considered inferior. Nation-states tend to believe that they need a national language to distinguish themselves from their neighbours, even if they are in essence speaking dialects of one tongue. Norwegian, Danish and Swedish, for example, could easily be considered a single Scandinavian language; Croatian, Serbian and Bosnian are dialects of Serbo-Croat; Hindi and Urdu are more or less the same language, as are Macedonian and Bulgarian or Moldovan and Romanian. A dialect is a variant of the perceived ‘standard’ language, but remains comprehensible to those speaking both the standard and other dialects of it. So 1,000 years ago, what we now consider French, Italian and Spanish were dialects of Latin. Eventually they grew apart to the extent that they were mutually incomprehensible. A patois is also a non-standard variant. The word tends, however, to be used pejoratively. It comes from the Old French patois, which originally meant ‘rough, clumsy or uncultivated speech’. A pidgin is a basic but functional way of communicating which strips a language back to its bare bones. ‘Me Tarzan, you Jane’ gets the message across without worrying about grammar. Trade, exploration and conquest have all resulted in the creation of pidgins or lingua francas. They are often short-lived, but may develop into creoles. A creole is formed when a pidgin adopts a systematic grammar and vocabulary. It may then become a primary language for subsequent generations, who develop and finesse it. Though often associated with the Caribbean and the slave trade, there are about 60 across the globe, from Singlish in Singapore to Seselwa in the Seychelles and Chavacano in the Philippines. And sign language? There are at least 121 different sign languages and the smaller ones are endangered just as spoken minority languages are. They have also been suppressed in the past – British sign language, for example, was banned in the 1880s, its users forced to lip-read instead. Many countries do not officially recognize or protect their sign language(s). 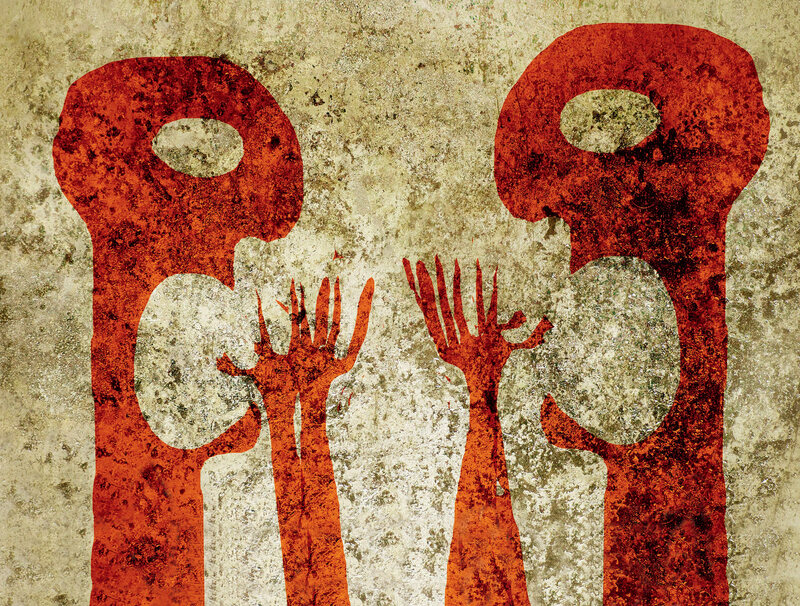 Sign language users develop their own dialects and variants; young deaf people invent sign-language slang and ‘youth-speak’ just like their hearing counterparts. 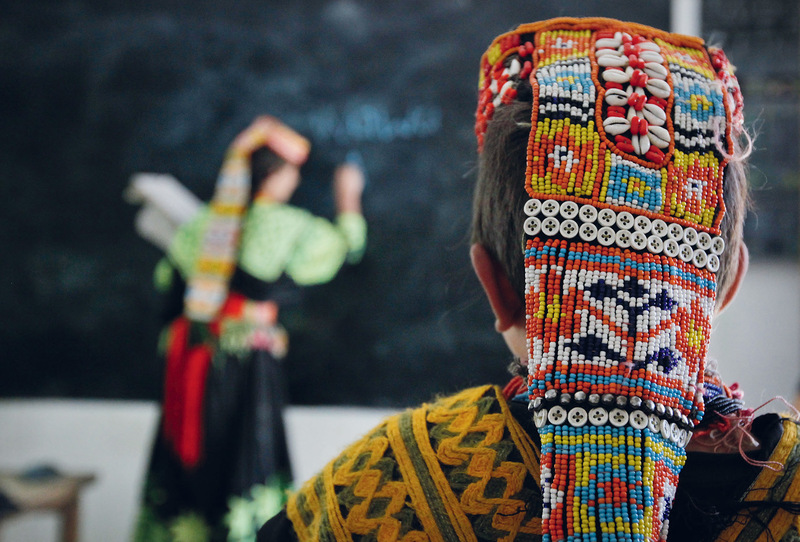 Keeping the language alive: just 3,500 of Pakistan's 180 million people speak Kalasha, here being taught at a school in Brun village. It is believed to be the closest modern language to Ancient Sanskrit. Electronic publishing allows the relatively cheap dissemination of books in minority languages and may encourage writers to publish in their mother tongue. Kenyan writer Ngugi wa Thiong’o committed himself to writing in his mother tongue, Gikuyu, while a political prisoner in the late 1970s. His support of ordinary Kenyans during the Moi dictatorship and his desire to communicate with them in their own languages led to his arrest. ‘If you want to hide knowledge from an African child, put it in English or French,’ he said in a keynote address to the Pan-African Reading for All conference in Tanzania in 2009. Some African countries have taken this on board: in 2013 Zambia announced that English would be the language of instruction in secondary education. But before the age of 11, children will be taught using one of seven (out of 70) official local languages. 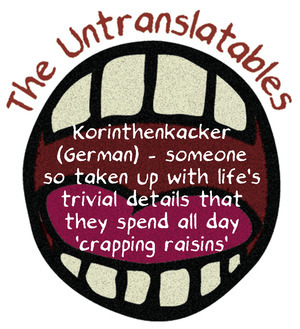 Korinthenkacker (German) – someone so taken up with life’s trivial details that they spend all day ‘crapping raisins’. Back at the Spanish Institute, as we talk about the frustrations and difficulties of keeping a minority language alive, a gloomy air has descended on the group. 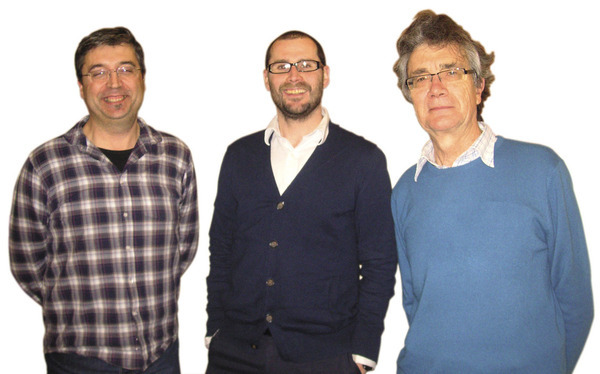 So when I ask Xaime, Carlos and Xesus whether they think Galician will still be spoken in 100 years’ time, I am surprised at the positive response. Enlightened government policies, pressure from the UN and ongoing academic research will go some way to improve the lot of minority languages. But such top-down approaches are not enough. Without the engagement of those speaking the languages, without a renewed sense of their worth and desirability and of their place in modern life, they will not survive. We all have a responsibility to fight for endangered languages, to ensure that we continue to live in a culturally diverse and vibrant world. Those of us who have access to a dormant mother tongue must speak it, value it and pass it on to our children. And those of us who don’t must embrace the opportunity to interact with and learn from other languages, knowing that each one has something to teach us. It is time to speak up for our multilingual world, and for minority language speakers to stand up and be counted. After all, every tongue has something important to say. For an in-depth look at the history of languages: Empires of the Word by Nicholas Ostler. For a fascinating exploration of the link between endangered languages and a sustainable world: Vanishing Voices by Daniel Nettle and Suzanne Romaine. Other good introductions to endangered languages from a linguistic angle include When Languages Die by K David Harrison, Language Death by David Crystal, Planet Word by JP Davidson, The Power of Babel by John McWhorter and Language in Danger by Andrew Dalby. Popular, travelogue-style titles include Spoken Here: Travels Among Threatened Languages by Mark Abley and Mother Tongues by Helena Drysdale. Carlos works with the Academia Galega da Língua Portuguesa, to promote the Galician language. 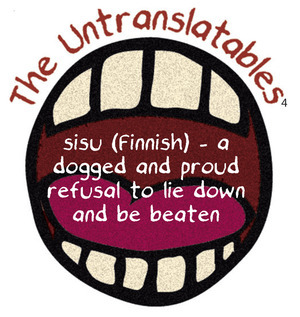 All ‘Untranslatables’ taken from The Untranslatables by C J Moore.